When soundproofing party walls in semi detached houses the optimal solution is to construct an independent soundproofed wall. However, this will result in a loss of space of between 100mm – 125mm (4 -5 inches). In todays houses this is often not an option. Mustwall 33B is designed to reduce the transmission of airborne sound with the minimum loss of room space. Using Mustwall 33B the whole system will take up less than 50mm! 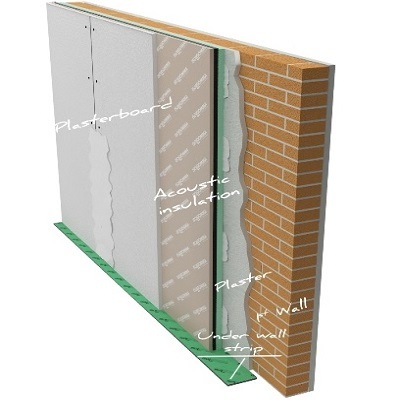 Using the Mustwall 33B thin wall soundproofing system an Rw figure of 59dB can be achieved based on a standard 215mm block party wall. The system is easy to fit – requiring very liitle DIY experience. See below…..
Lay strip of Stywall 45 on floor. Fix Mustwall 33B to the existing wall using Mustwall plastic fixings. Fix strips of Stywall 45 to Mustwall 33B as per data sheet. Fix layer of 12.5mm plasterboard to Mustwall 33B using Fix All adhesive. Stagger the joints between the two layers. Leave a 5mm gap around walls and fill with acoustic sealant. The wall can be finished by plaster skimming or as desired. Skirting board should be fixed with glue or plasterboard screws. If using screws ensure that they do not bridge the insulation layer. Leave a gap between skirting board and the floor and also a gap in the corner. This ensures the wall remains “floating”. This gap can be filled with acoustic sealant. The Mustwall 33B system will help reduce everyday noise, that should not normally be heard, i.e. speech radio and televison sound. Excesssive loud music and low frequency noise will still be audible although its overall intensity will be reduced. These situations are better stuited to our independent wall soundproofing system.